Definition at line 92 of file csrmsg.h. Definition at line 97 of file csrmsg.h. Definition at line 96 of file csrmsg.h. Referenced by CsrAllocateCaptureBuffer(), CsrCaptureArguments(), and CsrReleaseCapturedArguments(). Definition at line 98 of file csrmsg.h. 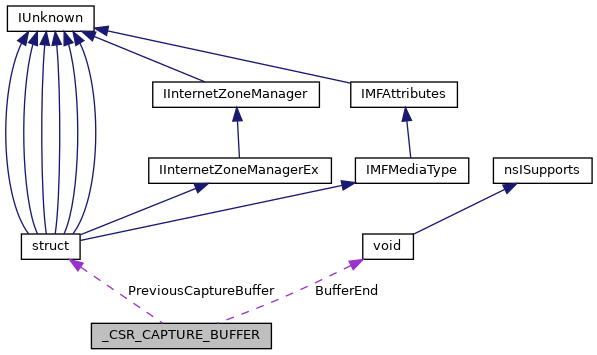 Referenced by CsrAllocateCaptureBuffer(), and CsrReleaseCapturedArguments(). Definition at line 95 of file csrmsg.h. Definition at line 94 of file csrmsg.h. Referenced by CsrAllocateCaptureBuffer(), CsrCaptureArguments(), CsrReleaseCapturedArguments(), and CsrValidateMessageBuffer().